Healesville, our sanctuary | Turning my world upside down! We arrived in Healesville to stay with Sheryl. We last saw her when we stayed as guests in her beautiful home 7 yrs ago. She is now running it as an Airbnb. Sheryl is not only a wonderful hostess but a great tour guide. There was no lack of activities for us to do in the 3 days we visited. On arrival, we met her partner Ron (again) and decided to visit the Four Pillars Gin Distillery. We were met there by Mary and Adam, buddies from their exchange to Ontario in 2014. The conversation flowed easily as Mary and I are in regular correspondence over teaching exchange matters. I mean practically daily! Leon had a gin taster with 3 flavours to try, accompanied by the house tonic water. The saying to retain was “don’t drown the hero”, in other words, use the tonic sparingly so you can taste the gin. After a good sleep, we woke up to a hot and sunny day. 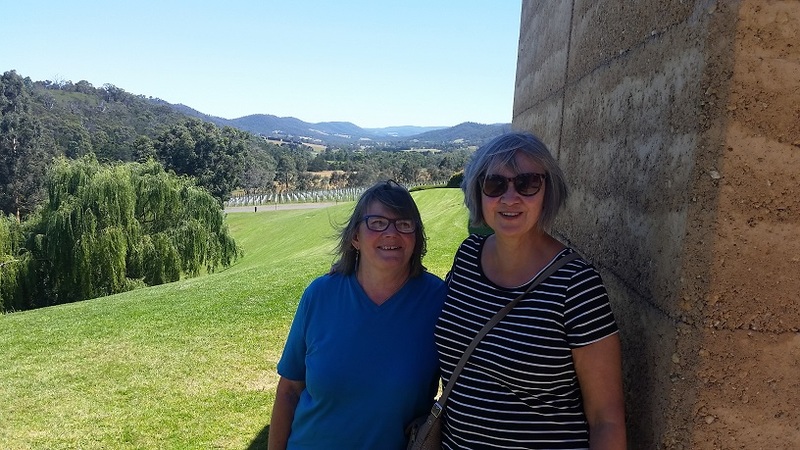 In view of the weather forecast, our plans to visit the Healesville Animal Sanctuary were postponed for a day in favour of a bit of wine touring. We did a tasting at Oakridge to start but quickly found it was just too hot to drink a lot of wine. After all, once you’ve tried 5-6 wines, you’ve had a pretty full glass of wine. We drove to another winery but just had a look around the shop and chatted with one of the managers. 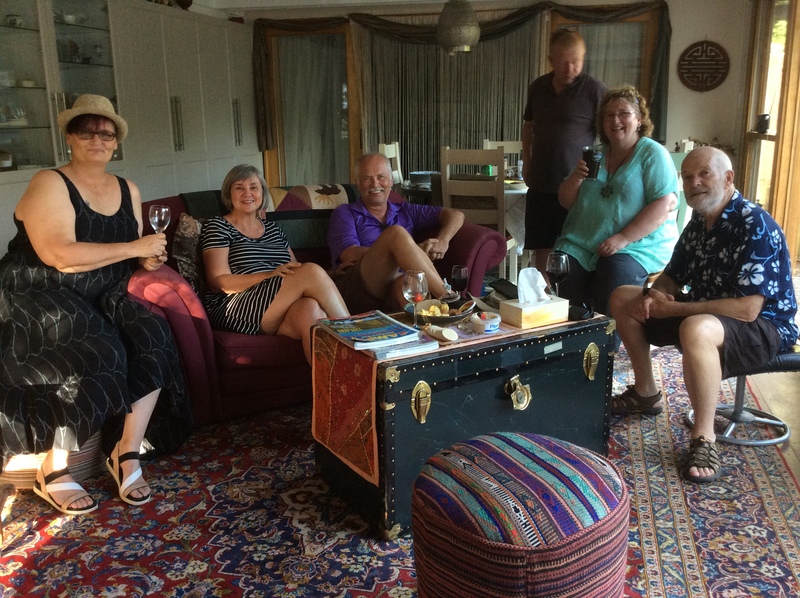 We took refuge in Sheryl’s passive solar house, cool at 26c, while the temperature soared to nearly 40c. The plan was to join Joanna (exchanged to Guelph in 2012) at Mary and Adam’s for a bbq. But the heat being so intense, there was a complete fire ban on, so we settled on cold meats and salads. Between the bubbly and the beer, no one went hungry or thirsty as the conversation just went nonstop. I remarked how fun it was to one minute be online with Mary and the next be cooking in her kitchen! The culmination of the evening had to be the visiting kookaburra family that Mary feeds with hamburger. We had time for plenty of photos and I even got to feed them! 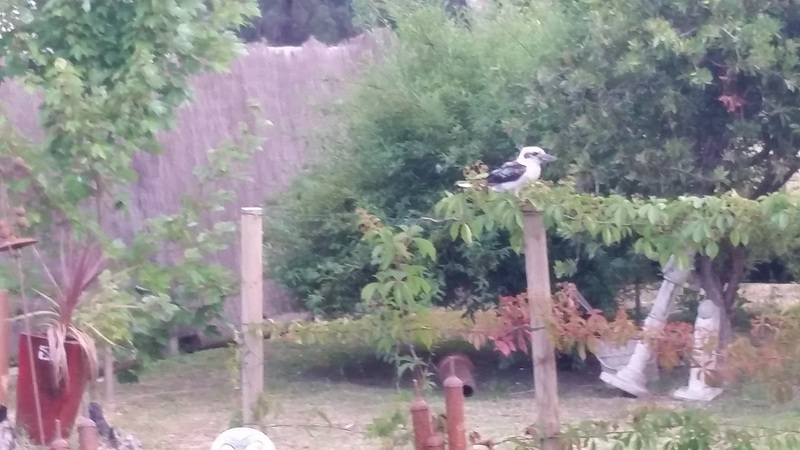 They make a funny growling noise and reserve their kooka sound for dawn and dusk. Sheryl says it’s as if they tell the other birds it’s time to get up or time for lights out. The next day, after a hardy breakfast, Leon and I went to visit the Sanctuary. We spent 4 hours looking at all manner of Australian animals, birds and reptiles. We watched a bird of prey show and I even got to see 2 platypuses or is that platypi? When we returned to Sheryl’s, she offered to take us to a local trout farm for some very fresh fish. She asked for 4 trout of a certain size and they were instantly caught with a net and gutted for us to grill that night. She also served us some of the best smoked trout I have ever had! The running joke over our visit with Sheryl has been her simple food which suits my food restrictions (as well as Ron’s). She calls is “Eating Naked”. She and I have to write a cookbook together! Maybe a New Years project? We took a quick turn to feed the wild birds in the nearby dam. 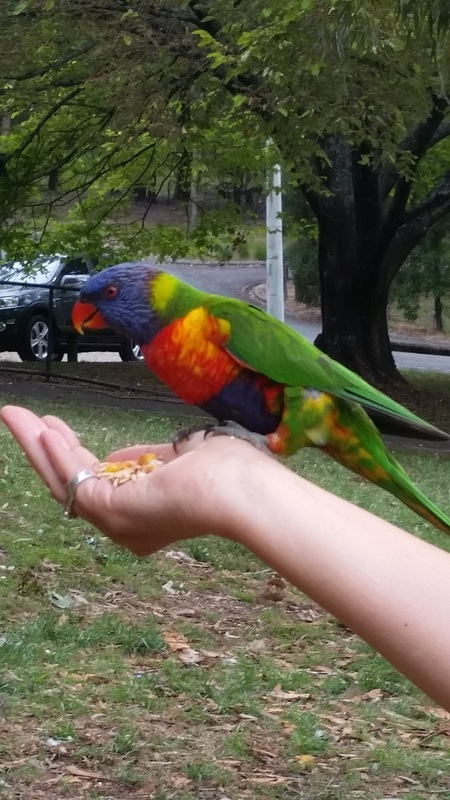 The parrots and lorikeets just came right into our hands to feed. We talked late into the night, went to bed and had a great breakfast before going on our way to Melbourne. But not before visiting the local Chocolaterie for some treats to bring to our friends in the city. 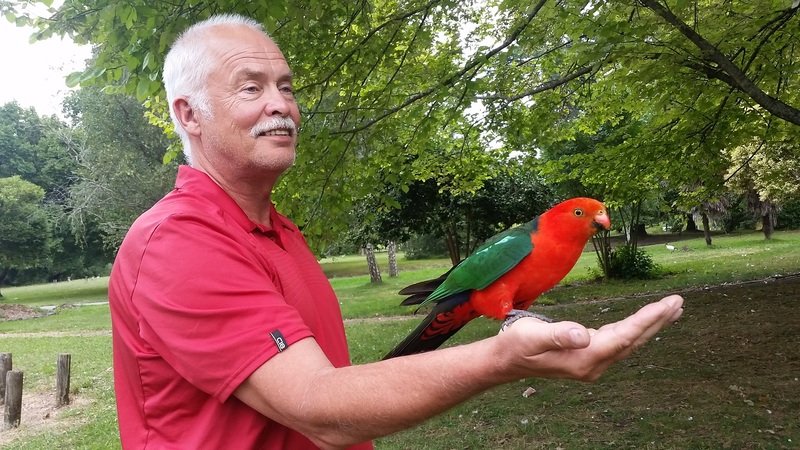 Healesville is a great place to see wildlife. How lovely for you to catch up with so many friends. Oh my gosh! That bird looks like it could be a cartoon! lol.I have the best recipe for caper trout, how do you prepare yours? Usually baked with a paste if soy, ginger and chili.